THE LIFE AND ARTISTIC CAREER OF PAVEL KORIN (1892-1967) COINCIDED WITH THE RESTORATION OF THE INSTITUTION OF THE PATRIARCHATE IN RUSSIA. HE WAS PRIVILEGED TO MEET ALL THE PRIMATES OF THE RUSSIAN ORTHODOX CHURCH ELECTED DURING THE SOVIET PERIOD, FROM TIKHON TO PIMEN, THE FUTURE PATRIARCH. THESE FATEFUL ENCOUNTERS TOOK PLACE AT A TIME WHEN THE VERY EXISTENCE OF THE RUSSIAN CHURCH WAS CHALLENGED. Pavel Korin, a committed Orthodox believer, was descended from a patriarchal family of Palekh icon painters. He came to Moscow in 1908 and joined the icon workshop at Donskoy Monastery. Soon afterwards he met Mikhail Nesterov, who in 1911 would work at the Cathedral of the Holy Protection at the Marfo-Mariinsky Convent. Korin assisted Nesterov with the work on the cathedral, gaining the opportunity to meet the most renowned religious figures in Moscow of that period. He also became acquainted with Grand Duchess Elizaveta Fyodorovna, Mother Superior of the convent, who asked him five years later to paint her tomb in the crypt of the cathedral, and soon invited him to teach painting to her charity students. In that way, Korin received his first significant commission as an independent artist: Elizaveta Fyodorovna played a considerable role in the artist's life and until his last days he remembered his patroness with gratitude. In 1917 he wrote: "I am indebted to the Grand Duchess for life." In the summer of the same year, Archbishop Tikhon (Belavin) was elected the ruling hierarch of Moscow. According to his contemporaries, as the head of the Moscow diocese Tikhon quickly won his congregation's affection. Korin saw Tikhon when the latter, as the Metropolitan of Moscow, visited the Marfo-Mariinsky Convent. 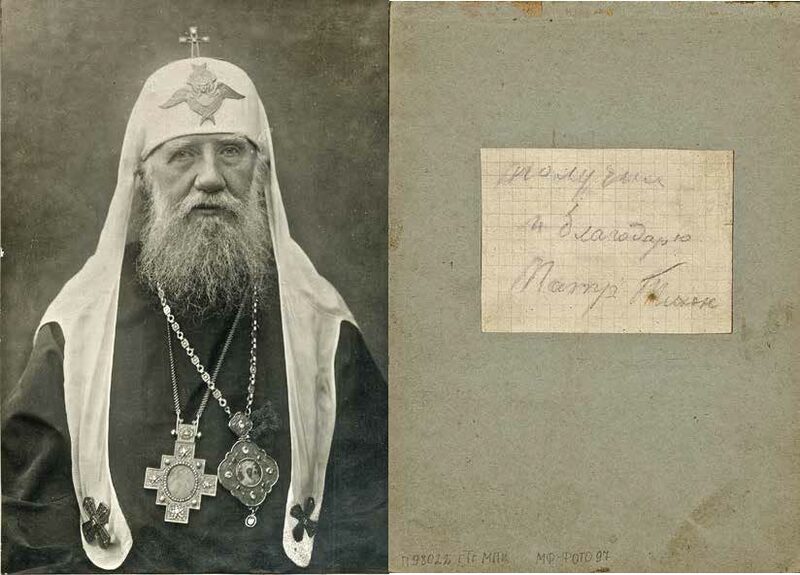 Korin also respected Patriarch Tikhon highly and tried to attend all the Patriarchal Liturgies in Moscow. When Tikhon was arrested and tried in May 1922, Korin was very distressed: at that time, many faithful Muscovites considered it their duty to bring a parcel to the Patriarch who was a prisoner in the former Treasurer's Chamber at Donskoy Monastery. Korin also visited the monastery and brought a parcel for Tikhon. To thank him, the Patriarch gave the artist his photograph with a piece of paper, with the words inscribed on it: "I have received it, thank you. Patriarch Tikhon." Korin treasured that paper stuck on the back of the photograph as a blessing. On the funeral day the service started at seven o'clock in the morning and continued until dark; both Korin and Nesterov attended the service. "The doors of the cathedral were wide open and those at the front in the crowd, although unable to get inside, could still hear the liturgy; the chanting reached even farther. It rolled over the rows of people - from the first to the last they chimed in, and the crowd of thousands was chanting. "6 On April 12 1925 the artist wrote in his notebook: "Donskoy Monastery. Patriarch Tikhon's funeral... A great many people attended. It was an eventide, quiet and clear. People stood with candles alight, some of them were crying, one could hear funeral chants. An elderly schema-monk walked by. It should be painted, it cannot just disappear. It is the Requiem! "7 Thus the artist conceived a painting that could immortalize the Russian clergymen and laypeople who seemed likely to soon become extinct under the new Russian regime. Korin attended the funeral service at Donskoy Cathedral and heard Metropolitan Trifon (Turkestanov) speaking with deep sadness about the Patriarch's death, and also about the situation in the country. "We have to bear our cross," the Metropolitan said, "and as I noticed, afflictions befall us to remind about that; sometimes we anticipate the disaster but more often it catches us unawares, just as has happened now..."8 In the years after the revolution Metropolitan Trifon became the true spiritual leader of the Moscow community; he was also well-known in the circles of the artistic intelligentsia. His words expressed the feelings of many Orthodox Russians who saw bad omens in the contemporary events. Metropolitan Trifon perceived the calamities befalling Russia and the Church as the sign of the approaching apocalypse, and Korin shared that view. "There, at the Patriarch's funeral, a vague thought emerged to paint that expiring world - the memorial service, the Requiem, sometime in the future," Praskovia Korina wrote.9 The artist changed the painting's title many times, as well as the composition of this epic work dedicated to the death of Orthodoxy under the new regime. Initially Korin chose an apocalyptic theme, "The Last Judgement in the Valley of Jehoshaphat"; then he later thought to paint Russian Orthodox clergymen gathering at the Assumption Cathedral in the Kremlin. According to Praskovia Korina,"He finally decided to depict them leaving the cathedral to the funeral tune of 'Holy God'. 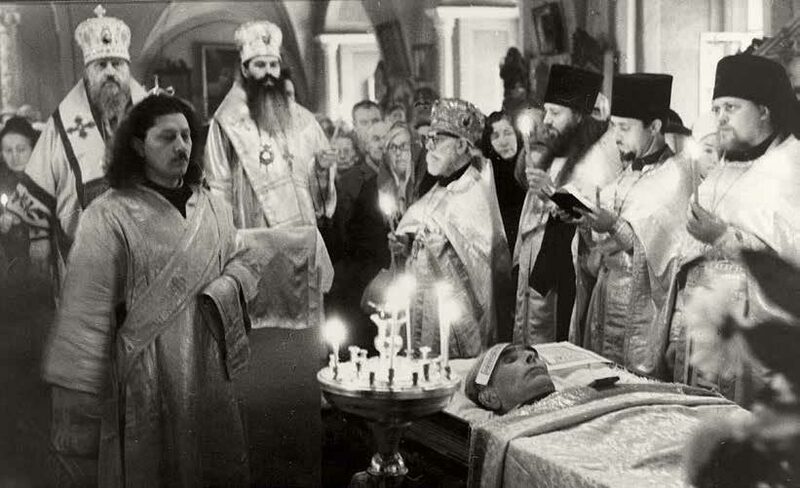 P[avel] D[mitryevich] described it himself as the moment when the liturgy was over, the candles had already been extinguished, and all people were leaving the church, inspired by true, passionate faith in the days to come. "10 The work on that painting later helped Korin to meet many clergymen, including the Patriarchs elected during the Soviet times. 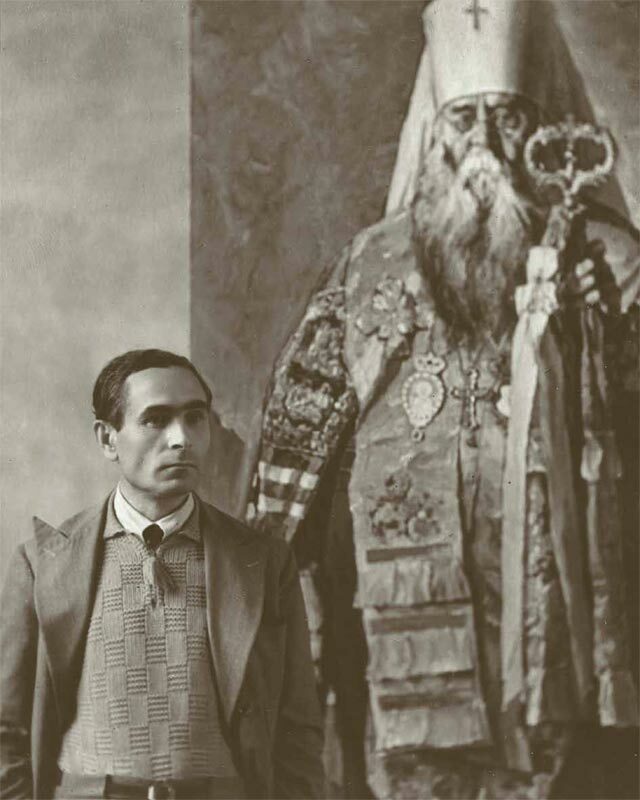 It is interesting to note that, when painting the double portrait, Korin depicted the young hieromonk as an unflinching, strong-willed and powerfully built man, yet in photographs from the 1930s we see another Pimen - humble, quiet and withdrawn. By then he had already been interrogated by the GPu (the State Political Directorate) and charged; he would serve years in labour camps and endure such hardships that only a man of truly undaunted spirit could survive. The artist's godson, Alexei Georgyevsky, once told a revealing story about Pimen's humility: "Korin didn't like to show his paintings before they were finished and he warned his 'models' about that at the very first session. However, only hieromonk Pimen did not show any interest in the final result. After the last session, he just said goodbye to the artist and left... Many years later, already elevated to the rank of Metropolitan, the eminent Pimen explained: 'Since the artist warned me that he would not show the portrait before it was finished, I thought that probably he had not finished it yet. '"17 Actually, rather than just paint a life-like portrait, Korin in his sketches often sought to reflect his subject's inner self, the essence that he could perceive as an artist. In the late 1930s only four acting Primates were free; one of them was the actual head of the Russian Church, Metropolitan Sergius (Stragorodsky).19 All the others were either exiled or retired. Korin's portraits earned him fame and respect among the Moscow clergy; he also knew Metropolitan Sergius. 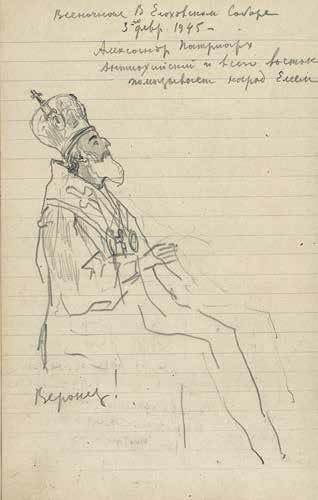 In 1936, one week after the liturgy at the Epiphany Cathedral in Dorogomilovo, he sketched the Metropolitan from memory. A year later, in 1937, Korin finished a large-size official portrait of the Metropolitan which he thought to include in his "Requiem" painting. Here again we can speak of the artist's intuition: he painted Metropolitan Sergius as a stern man absorbed in his thoughts, although in Moscow church circles he was called "grandpa" for his kindness and gentle nature. Parishioners also recalled that Sergius' liturgies differed from other episcopal liturgies for their "homely", warm atmosphere that lacked official grandeur. 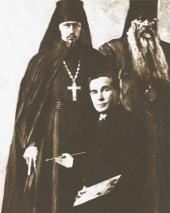 Many years later Patriarch Pimen described Sergius as "a wise and kind man, friendly and humble in heart".20 Nevertheless, speaking of Sergius, Pimen would emphasize that "he was a true and pure man of faith who scrupulously observed his monastic vows".21 The clergy knew of Metoropolitan Sergius' austere, ascetic lifestyle. As Metropolitan Pitirim recalled, "He spoke several languages, including the ancient ones - Hebrew, Greek and Latin, and read daily the Bible in those languages despite his age and excessive administrative duties. Also, he adhered to an ascetic lifestyle and started his day at 4 a.m. in accordance with the ancient monastic practice. His everyday prayer rule always included 'The Twelve Psalms Rite'. "22 Korin's painting of Sergius portrays those very characteristics of the Metropolitan: his inner concentration and austerity, first and foremost applied to himself. With the outbreak of the Great Patriotic War, official policy towards the Russian Orthodox Church changed23. At Metropolitan Sergius' request and with Stalin's approval, the Council of Bishops assembled and a Patriarch was elected24 (Metropolitan Sergius was enthroned as Patriarch in the same year). 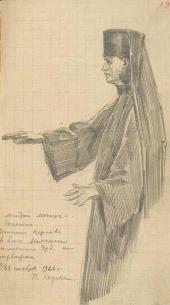 In a sketch which Korin made for his "Requiem" while working on that painting from 1935 to 1959, he placed the Patriarch in the centre, using the 1937 portrait of the Primate: he simply painted over the robes and the headdress, changing it to a patriarchal koukoulion. The remarkable fact is that the artist painted the robes red, although in the Russian Orthodox Church the regular colour of Patriarchal robes is green, a fact of which Korin must have been aware. He probably painted Sergius in red robes after seeing them on the representatives of the Ecumenical or Jerusalem Patriarchates who arrived to Moscow to attend the Council of Bishops in 1945. 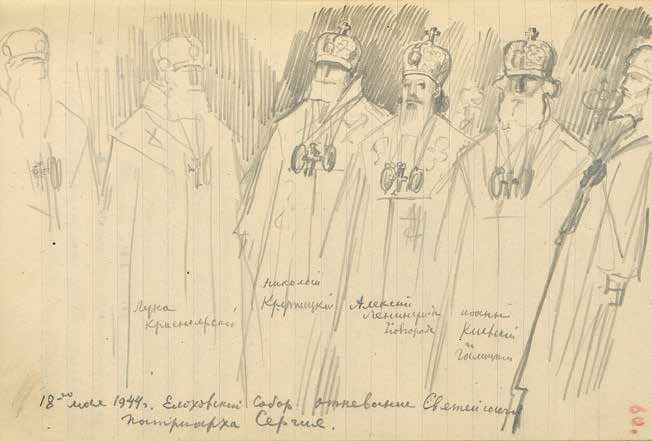 After Patriarch Sergius' death in 1944, Korin was present at his funeral and sketched the Primates who were in attendance. Among them were Archbishop Luka (Voyno-Yasenetsky) and Metropolitan Alexy (Simansky), who would be elected Patriarch a few months later. His election took place at the Bishops' Council that started its work in Moscow in January 1945, and was the most festive event in the history of Russian Orthodox Church since 1917. For the first time during the Soviet period, Patriarchs and representatives of the other autocephalous churches came to Moscow. Among them were four Metropolitans, 13 Archbishops, and 29 Bishops25. Korin came to the Council and made many sketches, trying to depict everything that he saw there. 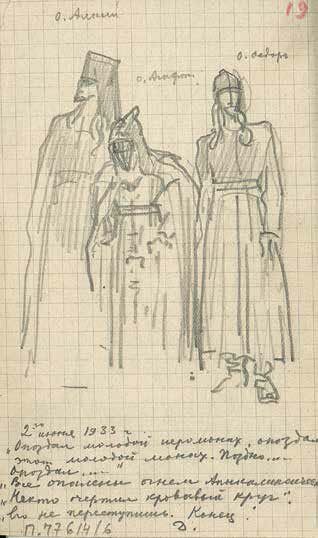 He sketched the Russian and foreign Primates, annotating the sketches in the margins, and his brief notes conveyed his delight and the feeling of an approaching festival: "January 31 1945. The opening ceremony for the local Council of the Russian Orthodox Church. I have attended the ceremony! 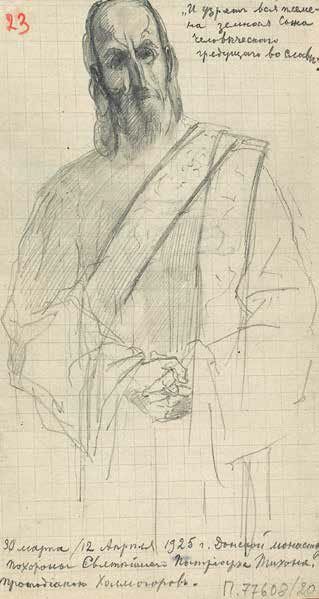 "26 The artist admired the solemnity and splendour of the event and the magnificence of the Primates' robes: "If it was possible to depict all these scenes, the paintings and the characters would be equal to those of Tintoretto and El Greco..."27 Korin quickly sketched the newly elected Patriarch, Alexy I, in pencil, marking the colour of his ceremonial robe in the margins. These quick, detailed sketches and notes on the colours confirmed Korin's intention to proceed with his painting. However, it was obvious from his notes that the artist's mood had changed and he no longer felt that the Russian Church was doomed. After the war and the election of the Patriarch the Russian Orthodox Church obviously revived: first, in 1946 the Trinity-St. Sergius Lavra, which had been closed since the early days of the Soviet regime, was re-opened, while two educational institutions resumed their work - the Seminary and Ecclesiastical Academy. The clergy, both bishops and priests, grew in numbers. Korin witnessed all those events as an insider in church circles. In the late 1940s he met Patriarch Alexy, a figure who was of great interest to the Moscow artistic intelligentsia. The Patriarch already knew about Korin, having heard of him from Nesterov and other mutual acquaintances. First, at the request of Sergei Georgyevsky, an employee of the Patriarch's office, Korin mentored the Patriarch's godson when he studied painting. Soon afterwards the artist inquired about the possibility of painting Alexy's portrait. "In 1948, on a Sunday, Pavel Korin and his wife were invited to the Moscow Patriarchate where they were introduced to Patriarch Alexy. The generous host offered his guests a cup of tea. At tea they remembered famous Moscow churches - historic landmarks, such as St. Nicholas of the Great Cross on Ilyinka street, the Assumption Church in Maroseika, etc... Before ending their conversation, they agreed on the time of the first sitting," Georgyevsky recalled.28 "Pavel Dmitryevich came to the Patriarch's office with his notebook and a pencil. At the exact set time, Patriarch Alexy entered the Red Chamber, wearing his ceremonial robe and koukoulion, as they had earlier agreed. Pavel Dmitryevich started sketching. After about 20 minutes, a secretary entered with apologies and said: 'There is an urgent call for the Patriarch.' Alexy returned after 15 minutes, but 10 minutes later he was called away to take an international call. After a while he returned, but without his ceremonial attire: 'Pavel Dmitryevich, they won't leave us alone with those phone calls. Let's postpone the sitting. 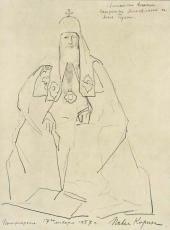 '"29 As for Korin's sketches, in addition to the one drawn at the Bishops's Council in 1945, two others exist, both dated 1957. Each of them represents the Patriarch in his ceremonial robe and koukoulion, standing and sitting respectively. Possibly, the incident mentioned by Georgyevsky happened much later - in 1957, not in 1948. According to Georgyevsky, in 1956 Patriarch Alexy invited Korin and his wife to his house at Peredelkino to discuss the future work on the portrait. They agreed that the artist and his wife would visit the Patriarch in Odessa while he stayed there for a holiday. Thus, combining work with holidays at the seaside, they would proceed with the portrait. However, that trip never happened, since Korin would suffer a heart attack. 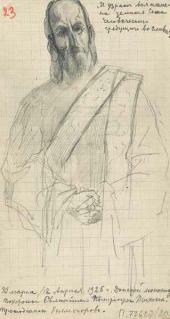 Even though the artist did not paint the portrait, Korin depicted Alexiy in a study for his painting: it is not a full-size portrait, but only the Patriarch's head in a koukoulion. The artist placed it in the centre, between Patriarchs Tikhon, whom Korin painted from his photograph, and Sergius. 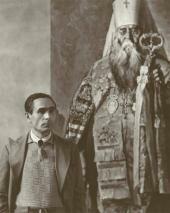 Korin often met the Patriarch at the liturgies in the Yelokhovsky Cathedral and elsewhere. In 1965, the artist had to travel to America with his exhibition, a serious, large-scale project that took much effort and strength. Given the importance of the trip, Korin went to the Trinity-St. Sergius Lavra to receive the Patriarch's blessing. 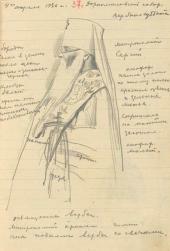 A year after her husband's death, Praskovia Korina brought a gift to Patriarch Alexy on his name day - the pencil sketch of the unpainted portrait. The Patriarch kept the sketch in his study as a memorial of the dear friend and respected artist until his dying day. As Praskovia Korina recalled, "When the sisters found out that their Mother Superior had been arrested, all of them rushed to the hospital's church, crying. A great commotion started as they ran, weeping, in all directions - down the stairs from the dormitory, from the hospital, from the garden" - Quoted from Miller, Lyubov. 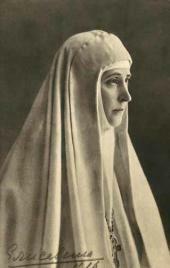 "The Holy Martyr Elizaveta Fyodorovna, the Russian Grand Duchess". M, 2013; p. 259. (Hereinafter, Miller). "Please ask Patriarch Tikhon to take my 'nestlings' under his wing and prepare my middle room for him. My cell should be used as a confessional and the big room - to receive visitors..." - Miller, p. 258. Alekseev, Vasily. "Invisible Russia". New York, 1952; p. 186. Memoirs; p. 110. ILN 7528. 'The Russian Light. Moscow Memoirs. 1923-1927' (November 1936) // "The Chronicle. An Orthodox culture publication edited by Hegumen loann": Published in Berlin by the Parish of St. Vladimir, Equal-to-the-Apostles; pp. 69-70. Tretyakov Gallery. Pavel Korin Research Department. The artist's notebook for 1925. Metropolitan Trifon (Turkestanov). "Love Doesn't Die... : From Spiritual Heritage". M.: Publishing Council of the Russian Orthodox Church, 2007; pp. 392-396. Memoirs; p. 111. ILN 7528. 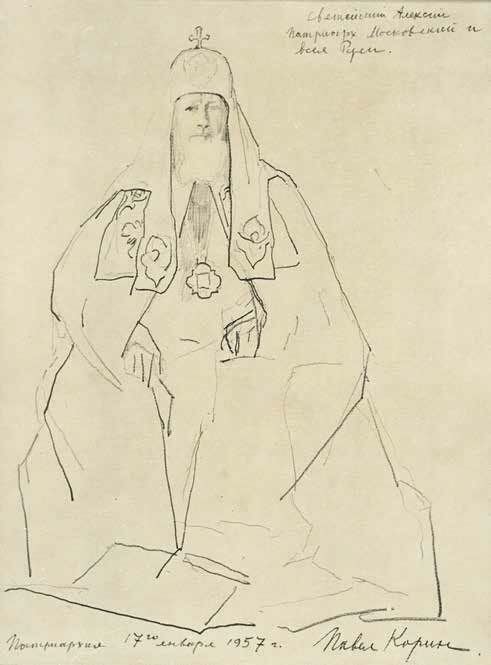 The sketch of Patriarch Tikhon's unfinished portrait that Nesterov drew in the 1920s is in a private collection in Moscow. It has been reproduced in the catalogue "Mikhail Nesterov. In Search of His Own Russia. On the 150th Anniversary". / Tretyakov Gallery. M, 2013; p. 423. Ibid., p. 2. ILN 13251. A rassophore, a monk at the first degree of Eastern Orthodox monasticism. Georgyevsky, Alexei. "The Border Scenes. A Collection of Historic and Artistic Miniatures". "Prosvetitel", 2006; p. 28. 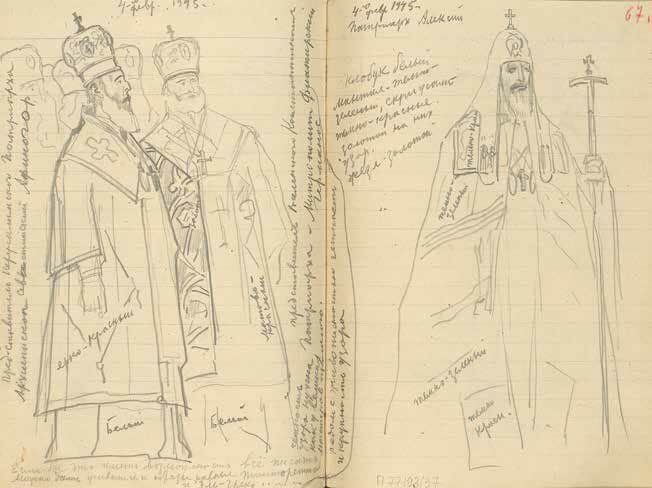 Korin's sketch"The Three Men (Father Alexei, Father Agafon and Father Fyodor) is kept at the Tretyakov Gallery, Pavel Korin Research Department. Inv. P 77614/6. Metropolitan Sergius was a deputy to the acting Patriarch, meaning that he was the deputy to Pyotr (Polyansky), the acting Patriarch who had been arrested. "The Passing Russia. Metropolitan Pitirim's Stories". St. Petersburg., 2007; p. 128. The sketch is kept at the Tretyakov Gallery, Pavel Korin Research Department. Inv. P 44614/6. Sergei Georgyevsky. "The unpainted Portrait". Moscow, July 1981; p. 2. The typewritten text is kept in Alexei Georgyevsky's private archive. Guestbook at Pavel Korin's exhibition, 1963. Tretyakov Gallery, Pavel Korin Research Department. ILN 6246. 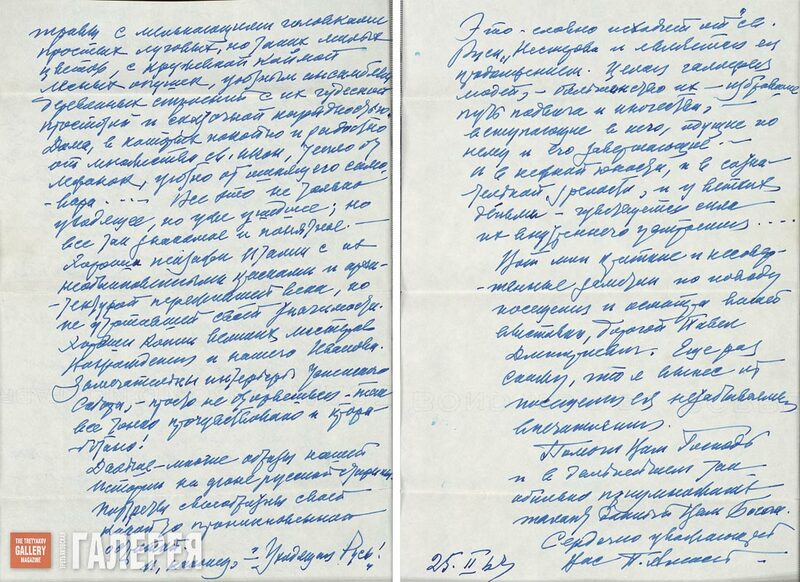 Letter of Patriarch Alexiy I to Pavel Korin. Tretyakov Gallery, Pavel Korin Research Department, 93272 MF-МЕМ 121. Pautinskaya, M."In Memory of Pavel Korin". Tretyakov Gallery, Pavel Korin Research Department. (+9/22. XI. 1967). A typewritten text. I was very pleased to visit your outstanding art exhibition. Certainly, I was well aware that you were a magnificent, brilliant and prolific artist of multi-faceted talent but your exhibition impressed me, revealing the unique nature of your works which proves that you are a great artist and your talent is a true gift of God. I liked all your paintings, every one of them. One can see that it is your lifework as it reflects your inner light and lifetime's experience. Your Palekh is magnificent with its wonderful Russian nature and the scent of Orthodox antiquity. The landscapes are typically Russian, tender and melodious - with wide meadows, with the sense of rustling grass, with gleaming heads of wild flowers - simple but pretty, and lacy forest skirts, with those homely rural houses remarkable for their exquisite rusticity and fairytale festivity. Many holy icons brought those houses joy and peace, stove-benches warmed them, and boiling samovars made them snug. These scenes represent something that is passing away - in fact, it has already passed away; yet, we all know and understand them so well. The Italian landscapes are beautiful, distinguished by their unusual colours and architecture that survived through centuries, yet retained its value. The copies from the great Renaissance artists and our Ivanov are excellent. I could not take my eyes off the magnificent interior of the Assumption Cathedral. Obviously, you felt that theme deeply and developed it thoroughly. There are also many historical characters against a backdrop of ancient Russia. The portraits' heartfelt exquisiteness makes them truly special. It apparently stems from Nesterov's "Holy Rus'" and continues the theme. We see a gallery of characters and most of them have decided to take monastic vows and fight the good fight. Some of them have just joined the monastic community, some have already lived their vows for years, and others are about to complete their life journey. But all of them - tender youths, mature men, and elders well-advanced in years - are remarkable for their inner strength. These are my brief, amateur notes on your exhibition, dear Pavel Dmitryevich. Once again, I can say that it was an unforgettable experience. May God help you in the future to continue reaping the abundant fruit of your talent that He, by His Grace, has given you. 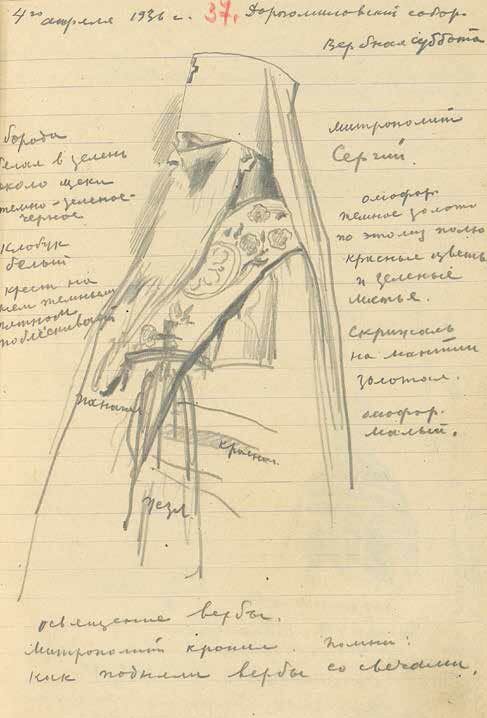 The sketch was made in the Donskoy monastery during the funeral service for the holiest patriarch Tikhon. The inscription at the top right: “and the tribes of the earth shall see the Son of man coming in the clouds of heaven with power and great glory”. 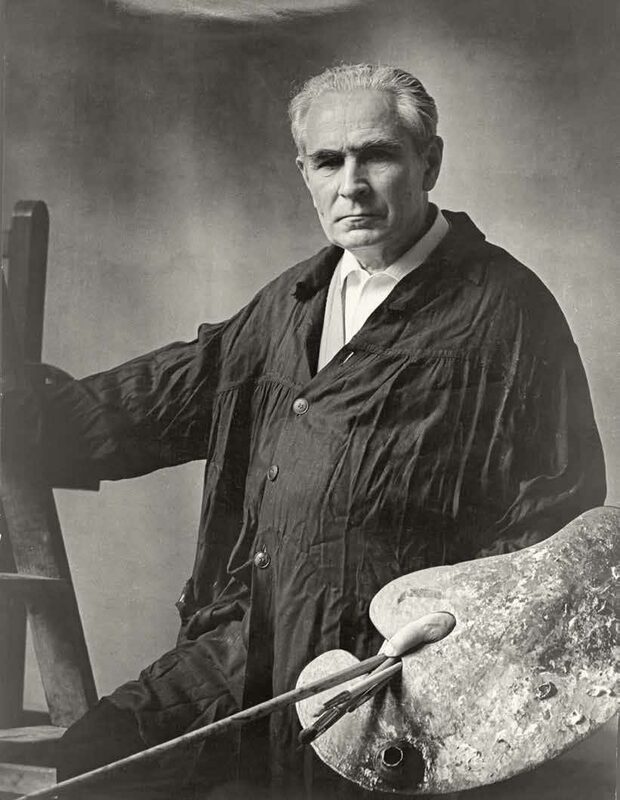 Pavel Korin in his studio. 1962.